Women’s Health : Borage Oil 1000 mg 60 sg. 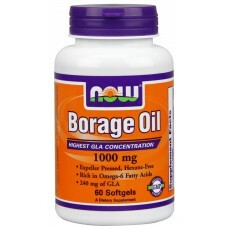 Home » Health Concerns » Women’s Health » Borage Oil 1000 mg 60 sg. 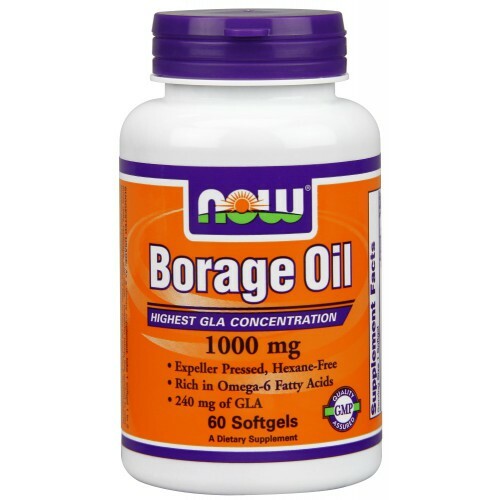 Borage Oil 1000 mg 60 sg. SUGGESTED USAGE: As a dietary supplement, take 1 softgel 1 to 2 times daily,preferably with meals. Consider taking this product in combination with NOW Omega-3 Fidh or Flax Oil and Tur-E Bio Complex. Borage Oil is a nutritional oil rich in polyunsaturated fats. Linoleic Acid and Gamma Linolenic Acid (GLA) are enhanced essential fatty acids. Although the body can manufacture GLA from dietary linoleic acid, it van be more efficiently utilized for body functions when supplied directly by dietary sources. Borage Oil is a more concentrated source of GLA than Evening Primrose Oil (EPO). One Borage OIl softgel is equivalent to about 5 stardard EPO . One Borage OIl softgel is equivalent to about 5 standard EPO softgels in GLA content.